Nine years ago, I bought one of the tree ferns from Lyndon that he imports from New Zealand and which remain his speciality to this day. These extraordinary plants lie dormant, permitting the trunk alone to be transported, apparently a dried-out husk – until you add water and it regenerates, sprouting tendrils from the top and resuming vigorous life in a new continent. 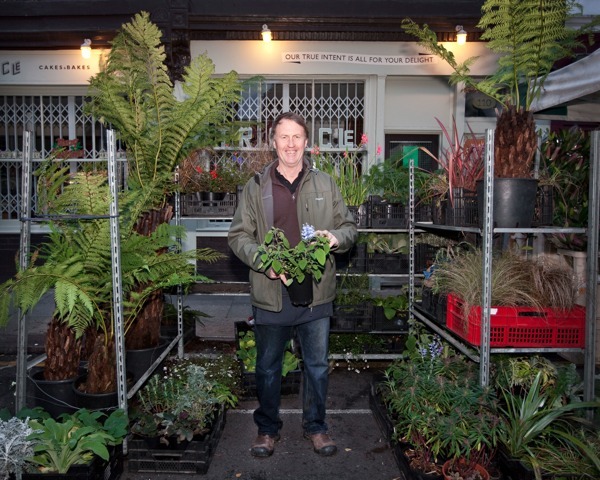 Over this time – just like his tree ferns – Lyndon himself has put down roots and shown dramatic growth too, establishing a nursery in High Barnet. And I have found that because Lyndon rears his seedlings in London, they are acclimatised to the conditions which improves their chances of thriving in my garden. In particular, Lyndon has become famous for his spectacular pelargoniums, especially the deep crimson “Lord Bute,” which I have spied in many of the discerning gardens of the East End over recent Summers. The copyright that exists on more recent strains sent Lyndon back to propagate nineteenth century cultivars, also more hardy and pest resistant that their modern counterparts. Starting from one trolley in Ezra St Market, Lyndon has now ascended to the lofty heights of plantsman appointed to Dunhill in Mayfair and Selfridges’ Shoe Shop. “Just as the nineteenth century aristocracy gave their gardeners free rein, these clients let me do what I want, and they love the idea of it being a small nursery, supplying plants grown up the road. I plant them up four times a year, and last time I was planting the Dunhill Shop, someone from Claridges came to speak to me…” confided Lyndon proudly, his green eyes shining in eager anticipation of what might follow. I thought of Lyndon when I visited the magnificent fern garden at Malplaquet House, so it was no surprise to discover that he supplied the ferns and is the principal plant supplier to Todd Longstaffe-Gowan, the landscape designer who lives there – collaborating on many of his projects including a forthcoming garden of tree ferns for the central atrium at the Royal College of Art. 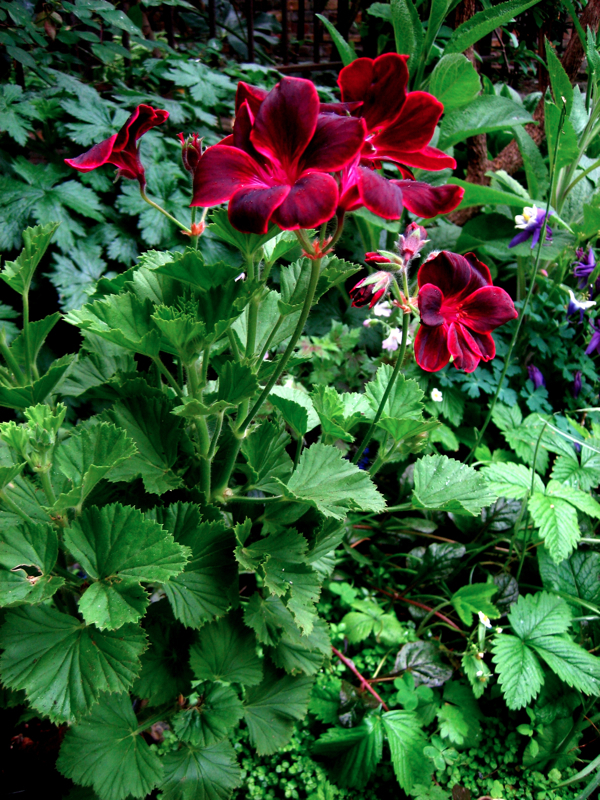 Lyndon Osborn’s pelargonium “Lord Bute,” photographed in my garden last Summer. You wont remember me but we have spoken a number of times on the phone having bought a tree fern from you many years ago. It was pride of place in our garden but sadly it died in the harsh winter of last year, have tried a couple of times to call you on the number that we have spoken on before with no luck (07946 303062). We need some advise please, if your number has changed if you e-mail me I will give you a call.